About a week ago, I received a fantastic food parcel from Damn Delicious! Yum! So much amazing food to sample…we’re all big carnivores in our family, so I was particularly looking forward to doing these reviews*. I was finally able to sample the Aberdeen Angus Steak Pie with my family on Friday evening. The pie I was sent by Damn Delicious was the medium one (1lb) for 3-4 people. You can see on the picture below that it’s a good-sized pie, with a generous layer of puff pastry and a deep Aberdeen Angus Steak filling. A generous layer of flaky, light, puff pastry over the top of the pie, but no pastry underneath. So: no soggy pastry and all the depth is meat! A delicious pie, packed full of scrumptious Aberdeen Angus Steak. At £8.25 for the 3-4 person sized medium pie, it’s not something you’d have every day, but given the quality and quantity of meat it contained, it’s worth the cost as an occasional treat. The flavour was fantastic. Despite the fact it could have done with a bit more gravy, I would definitely have it again. An indulgent treat rather than an everyday pie. Scrumptious! I was sent these samples for review. I did not receive any financial reward for writing the review and all product reviews I write are my own, honest and unbiased opinions. If you would like me to review your products, please contact me via Twitter, Facebook or E-mail. If I accept to receive products for review, I will send you the postal address to send them to. 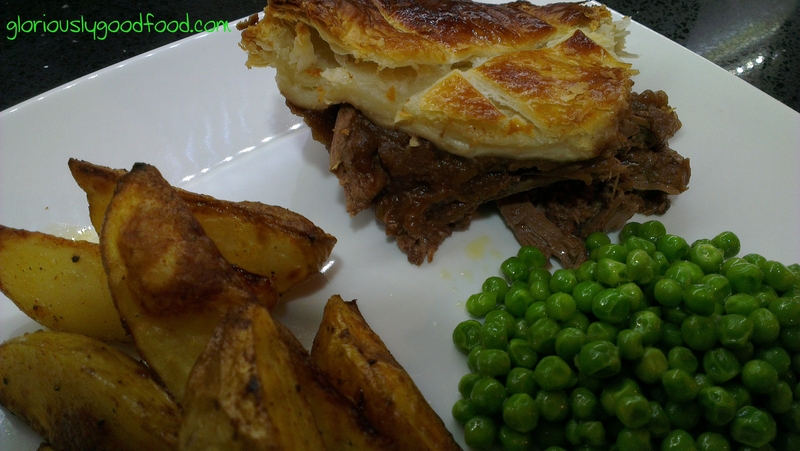 This entry was posted in Reviews and tagged Aberdeen Angus, Aberdeen Angus Steak Pie, Damn Delicious, Damn Delicious Steak Pie, puff pastry, Steak Pie. Bookmark the permalink.